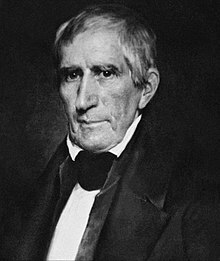 Before serving as the ninth President of the United States, William Henry Harrison was an accomplished American military officer who led the US military against American Indian forces in the Battle of Tippecanoe in 1811 and the Battle of the Thames in 1813. He was also notable for meeting with Simon Bolivar in Colombia, helping establish American-style democracy in South America. After a failed presidential bid in 1936, Harrison was again convinced to run on the Whig Party ticket in 1940, this time winning the election. He took office on March 4, 1841 as the oldest elected president until Ronald Reagan. Knowing that many people spoke ill of his age, he delivered a long inaugural address without a jacket the night he was sworn in. This caused him to catch pneumonia and he died 31 days later as the first fatality of the presidency. This created a constitutional crisis regarding presidential succession which was ultimately resolved by the 25th Amendment.